A Day at the Beach, or A Night at the Museum! We are only 100 kms from Truro or 60 kms from Amherst. 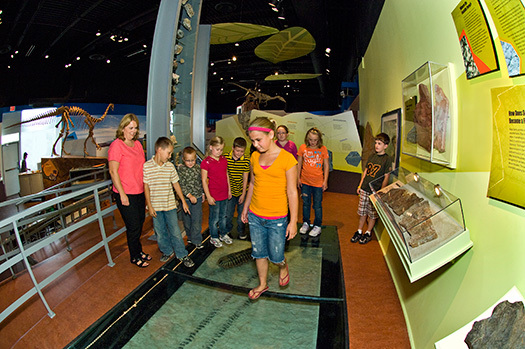 Add on to your trip with a visit to the Springhill coal mine museum, the Ottawa House Museum or the new Joggins Fossil Centre. Take advantage of our 3-5 hour day program including a museum tour, a workshop, and a field trip. Customized trips can be arranged. Our 20 hour (7:00 pm - 3:00 pm) program includes meals, a museum tour, a field trip to a mineral or fossil beach and two workshops. Our 24 hour (1:00 pm -1:00 pm) overnight program includes meals, a museum tour, two field trips and three workshops. We welcome your calls and are happy to individualize your program. Book now! We look forward to seeing you at the Fundy Geological Museum in Parrsboro, N.S. Day trip (3-5 hours) - All Nova Scotia schools get this program at 50% off. Choose one field trip and one workshop. All overnight groups (below) pay a fee of $200.00 per group + tax for sleeping at the museum. Choose one field trip and two workshops. Day 2: breakfast, lunch (hotdogs) and snack. Choose two field trips and three workshops.